Ageing With Pride, a campaign by Birmingham LGBT, aims to promote the lives and lived experiences of older LGBT people from across the city, focusing on the positive contributions those over the age of 50 and who are lesbian, gay, bisexual and transgender have made to the region both today and historically. The 12-month campaign, which launched in August 2018 and is led by Rico Johnson-Sinclair, seeks to empower LGBT people to continue to be themselves, while promoting social mixing between generations, and addressing issues around ageism. Ageing With Pride was funded by a nationwide project called Ageing Better, which in turn is a National Lottery Community Fund funded programme across the UK. Maria Hughes is the Network Enabler, Ageing Better LGBT Hub in Birmingham. She explained that Ageing Better aims to combat isolation in the 50 plus population. It is also a wider research project about loneliness & isolation with the aim of presenting to government the dangers of loneliness & isolation and the case for increased funding to combat it. 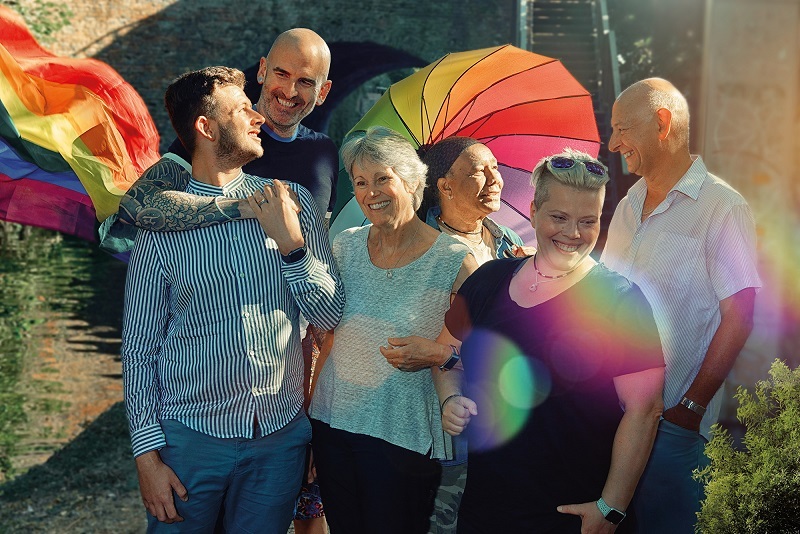 Together Rico and Maria set out to promote the positivity around ageing to combat some of the misconceptions and stigmas around ageing, specifically in the LGBT community. To learn more, I sat down with Rico and Maria to discuss this amazing campaign further. Rico: Members of the LGBT community over 50 have specific needs as they grow older and they are not being catered for at present. There have been many recorded instances of older LGBT people in care who are not receiving the proper care for their identity. Similarly, there are LGBT people with dementia who have regressed and forgotten they have come out or transitioned. These are specific issues that need to be spoken about before anything happens on their later life path. There is also an invisibility issue around older LGBT people, and that’s why we chose to have such a big and visible ad campaign. We wanted the campaign to be as visible as possible so that it normalised what people were seeing. Rico: Ageing With Pride is split into three strands. The first strand was called ‘Keep Your Rainbow’. This encouraged people over 50 to be out and proud, where safe and practical. The only way we can start having conversations is to prove the vast number of people over 50 who are LGBT and that they need to be visible in their communities. We launched this first strand of work in November 2018 as part of Birmingham’s Shout Festival, which is a city-wide celebration of queer arts and culture. The second strand is called ‘Bridging the Gap’. The LGBT community has such a big problem with ageism, we wanted to try and combat that. This is our current campaign strand which we launched in February as it was LGBT History Month in the UK. Our final strand called ‘Continuing the Journey’ will launch later this year and will be about creating a resource in the City that older people can tap into. This could be linking people up to groups, meetings or services aimed at older LGBT people. We hope this will help encourage people to keep on the positive path as the campaign comes to an end. How are you spreading the messages and awareness of the campaign? Rico: It’s two-fold, on one side we are spreading the campaign’s visuals loud and proud around the city to raise awareness and acceptance, while on the other side we are specifically targeting places where older LGBT people may go, for instance Doctors surgeries, to help them reach out and take the first step to get involved. For our advertising, we chose billboards, bus stops and other highly visible locations to place our advertising. We also chose to place advertorial in major LGBT magazines such as Attitude and Diva to help younger people have visibility of this campaign. Why is cross-generational work so important and what specifically is being done to promote x-gen work? Rico: Older LGBT need to feel comfortable in LGBT spaces that are typically seen as younger spaces but also, we want to encourage younger LGBT people to begin having thoughts about later life and making good decisions on how best to prepare for that. The older LGBT community was instrumental in building the community and fighting for the freedoms younger people sometimes take for granted. It is important to help the younger generation remember and celebrate our shared history. Especially in the current political climate where come of our rights are at risk of being rolled back. That’s why it was important for us to launch Bridging the Gap in LGBT History Month. We wanted to get younger LGBT people in the same room as older LGBT people to have conversations about history. It’s why we’re creating a series of 12 short films focussing on older LGBT people and their lived experience. Maria: Also, we know there’s an appetite from younger people to learn about LGBT history, but where are people meant to learn about when there are barriers to accessing those lessons in mainstream education. It not only gives younger people a chance to learn about their history, but it makes them feel part of the culture as well. Ageing With Pride has been running since August 2018, what have been some of the key milestone events? Rico: Our community and partners launch was important as it set the wheels in motion, but also there was an important milestone when the first major strand began in November at Shout Festival. With regard to visibility, when our first splash of advertising went out around the city, that certainly was a powerful moment too. And, more recently, we have had specific events as part of LGBT history month, including Gay Birmingham Remembered. Coming up we have an event called Generations which aims to get older and younger LGBT people in a room to have a really frank and honest conversation about ageism. We’ll talk about the issues, what the barriers are and what we can start to do to break these down. Rico: It’s been received positively, especially by other organisations across the city that deal with older people generally. We’ve done a lot of work with GPs, hospices and care homes, and we’re happy with the level of support. What has been your personal highlight of the campaign? Rico: In terms of what gives me sustained joy, it’s going to our group Rainbow Bridge and seeing the people engaging with that just makes me so happy and proud. Maria: Rainbow Bridge was set up through the Ageing Better programme and is a twice-weekly coffee morning for all ages and backgrounds to help to ‘break the ice’ so that people can meet each other and get a taste of what different community groups the Birmingham LGBT Centre can offer. It also has a strong focus on allies and the role they play. It has also provided a sounding board role to external organisations who can come in to connect with the LGBT population and ask them questions. It helps LGBT people have a voice knowing that people are listening. Rico: I think the point in the campaign when I felt this work was most beneficial was when the first bus shelter posters went up. We used people from the community as models and it was so empowering to hear our models be so exicted about seeing themselves out there. One of our models even told me that someone who she hadn’t spoken to for a long time saw her on a poster and reached out to her. This showed me that the campaign was working. How do you define success for the campaign? Rico: It’s tricky as our campaign is more about hearts and minds and raising visibility. But we have been monitoring the reach of the campaign and we know that so far we have reached over 10 million people which we are really proud of. What legacy will it leave? Rico: We’re looking at what that legacy will look like because we want to ensure that the good that we have done in this campaign doesn’t just end when the campaign ends. We’re looking at things that already exist and how we can cascade people into them. Specifically, Maria’s Ageing Better work will still exist so it’s about making sure people know this and that there are pots of money out there for them to step up and start their own social groups. We will also be encouraging the community to pick up the mantle of taking positive action on breaking down isolation themselves. We will be leaving people with a toolbox of ideas that they can dip into to help each other, including encouraging younger people to reach out and help older people. In terms of a tangible legacy, we will have our series of short films and written blogs featuring older people telling their stories. These will be available on our website for all to see and I hope they capture the positivity of the campaign. They also should give hope to older people who still feel isolated that things can get better and there is help out there. Maria: I feel like there’s been great synergy from us, both of our projects share the same ethos and the Ageing Better programme finishes in 2021 so I have the resources to help take on the legacy from the visibility raising through the Ageing With Pride campaign. Rico: My overriding hope for the legacy of this is that older LGBT people feel less isolated than when we started and that more people are engaging with the Birmingham LGBT Centre. I think that will be a positive way to end this campaign.